Dallying In The Dirt, Issue #278 - There is a half frozen Hibiscus on my deck. Here is my Hibiscus standard providing a perfect example of the strange weather we have been experiencing this fall and all year. It’s the 19th of November and we have had two frosts and yesterday it was +20 C. The two frosts have not been that cold which is why I have a half frozen Hibiscus. I wait, each fall, until all of the leaves have been killed by frost before I bring it inside for the winter. This is the best method I have found for greatly reducing the quantity of unwanted guests that move in with it. 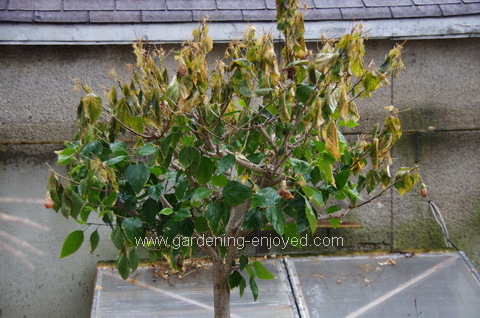 The cold kills the spider mites and the white fly and also removes the leaves they might travel on. The tree then receives a severe haircut, at least 2/3rds removed, and then it comes in. The cold does not seem to affect the older wood that it is cut back to and it breaks out into new leaves in a few weeks. All of the tender bulbs and tubers have been dug out of their planters and either moved indoors or are drying in the cold frame. They will come out of there in the next week, have all of the soil removed and then make their way to the box of shredded paper that will be their bed for the long winter’s nap. I was delighted this week when the contractor who has been playing havoc with my front yard all summer , actually came along and rebuilt the gravel path that winds through the yard to the street. I thought that was going to be me slugging wheelbarrows of soil and gravel. Of course, nothing is totally simple when dealing with local by laws. He was not allowed to make that pathway reach all the way to the asphalt road as that contravenes some code. He left about a 20 cm gap and he just happened to leave a wheelbarrow full of gravel part way up the walk that somehow found its way into that gap after he had left. Those two light frosts have been working miracles in the vegetable garden. These Leeks are now sweet and delicious. A little frost does that to them. They have been featured on the dinner table almost every night this week. They get chopped with some of the remaining Peppers into a vegetable stir fry or they get braised in some white wine to accompany some delicate trout. 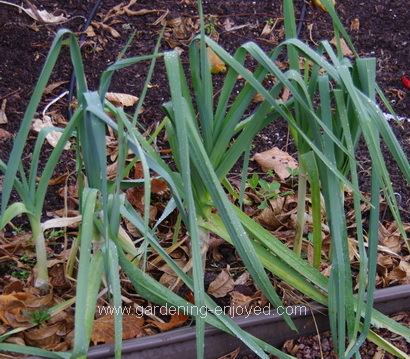 Eventually, if there is enough of them to be dealt with before the snow arrives, they will make a delicious Leek soup. There is also a magnificent harvest of Brussel Sprouts that will probably be gracing our dinner plates until Christmas dinner. Wandering out, through the snow, to the garden on Christmas day to harvest Sprouts for dinner is a bit of a strange tradition here. Now here is a chore that I must make sure that I complete. I don’t rush to cut down and clean up all of the perennial garden. Many of the perennials are happy to be left alone and then tidied a bit in the spring. My Iris are the exception. I do many things to deter a nasty creature, the Iris Borer, that thinks my gorgeous tall bearded specimens are his lunch. He overwinters as eggs on the decaying foliage. All of that foliage will be cut close to the ground and any dead leaves will be carefully picked up and all of that will find its way to the compost in the hope of denying him a winter home. Susann Asks? It seems every year I find or deal with something new in and around my garden ... after bringing in some geraniums, vinca vine, ivy and herbs to pot up, the new soil in the pots is turning white.. I scraped it off and it still comes back with a white film?? What's your take on this? Ken Answers! I have had this happen. I think it's a type of fungus growth or mould and it usually appears if the soil is constantly moist. Try letting the surface of the soil get quite dry between waterings. Dorothy Asks? You mention digging up the dahlia tubers in the last Dallying. I am relatively new to growing dahlias but have come to love them. I, too, noticed how much the tubers had grown from last year. 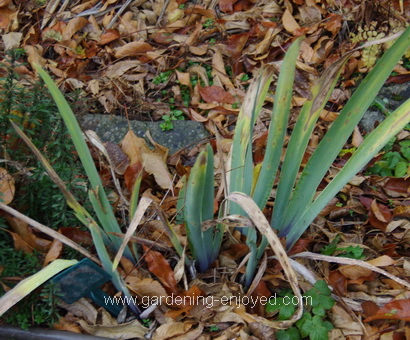 Can these be broken apart in the spring to make new plants or will that result in weaker plants? Ken Answers! It can be very difficult to determine where dormant Dahlia tubers will produce new growth. For that reason, I pot them up in the spring and then divide them when I can see where the new shoots are emerging from. Each piece will grow fine.